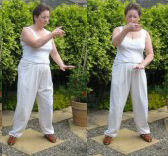 The cloud hands move is common in qigong patterns, warms ups and tai chi forms. There are many variations; some are static and others are moving exercises where you side step as your hands do the cloud hands moves. The static variations is a great home qigong exercise if you don't have a lot of space. The variations tend to be in the path that hands take - sometime it is a single circle with the hands tracing the path clockwise with the right hand and anticlockwise with the left. Other patterns use overlapping or just barely touching circles. At home you get to pick your favorite. The other major variation is how the hands and palms are positioned. Yang style tai chi has soft hands where the hands can face the body and Sun style tai chi has palms that always face 12:00 because they are bent at the wrist. 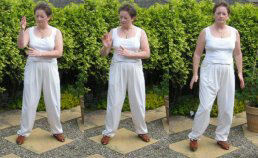 This particular home qigong exercise is taken from our shibashi routine which is a great routine for doing at home. If you would like to learn more please visit shibashi introduction or visit tai chi short form resources to learn more about tai chi forms. It looks like you are drawing rounded rectangles with your arms. With one hand going clockwise and the other going anti clockwise!. avoid waving your hands You get the effect from turning the waist and letting your arms just follow!